Today can be summed up with just one phrase: mind-blowing. 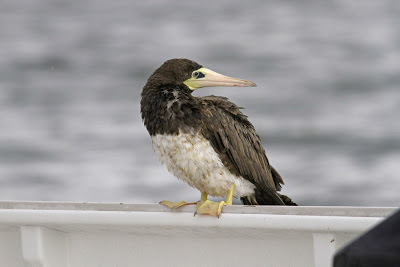 Late this morning (technically yesterday morning, by the time this gets posted) Patrick Comins passed along a shocking yet vague report of an adult BROWN BOOBY that was photographed on a boat in Westport, Connecticut earlier in the day. A first state record. All we knew at the time was the town in which it was taken...no further details. 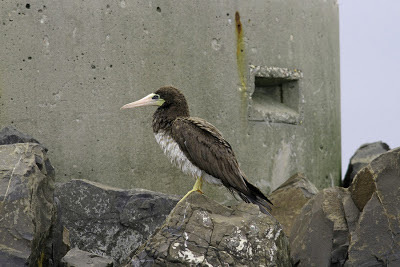 I made a bunch of phone calls and soon local birders were scouring the coast without any sign of the booby. In the meantime I was taking care of a few odds and ends before finally arriving in the early afternoon. Satisfied that the coast had been covered from land by others, I headed straight to the boat club to prepare the boat for its first excursion of the season. I was soon joined by Tina Green, Roy Harvey, and John Oshlick. We headed into Norwalk Harbor in search of the booby, which as far as we knew could have been long gone by then. But I had a good feeling that, given the crummy weather and the bird's habit of landing on boats, it could still be nearby. 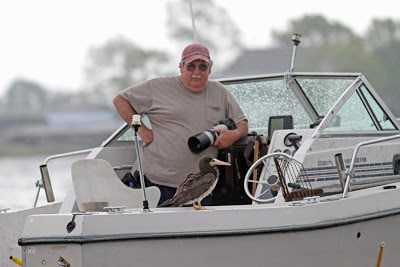 Just as we were exiting the harbor, John noticed that a nearby boater was busily photographing a brown bird in the water next to his boat. I recognized the boater as friend Larry Flynn (click here to read his account). Larry was indeed focused on a large bird in the water. It took us a few seconds to realize what was happening...Larry was photographing the Brown Booby. A few expletives were yelled as the bird lifted off the water and flew right past our boat. At this point I didn't know whether to captain the boat, watch with bins, or take photos. I think I managed to do all three although those few seconds are now just a blur. 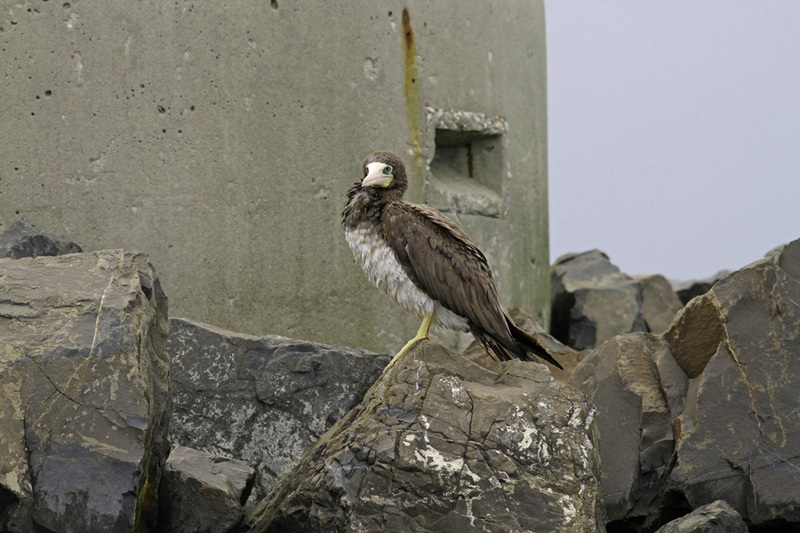 The bird wheeled around the mouth of the harbor a few times before settling down on a channel marker! 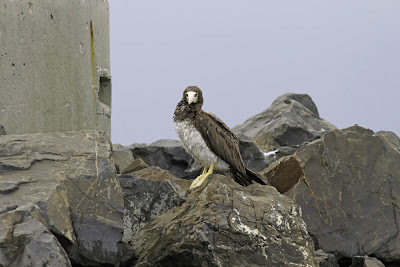 We were able to drive right up to the marker and enjoy the bird as it sat and preened at close range, oblivious to us. After several minutes of this, the booby again took flight, this time seemingly down the coast to the east. We spent a few more minutes searching before some nasty weather began to approach from the southwest. So we headed back towards the club. Larry got a head start, so he was well ahead of us when he called with news that the bird was sitting on a friend's boat back at the marina! Sure enough, the bird was right there. But it gets better. It did not spend long at rest before flying a couple loops around the harbor, which displeased the local Great Black-backed Gulls. 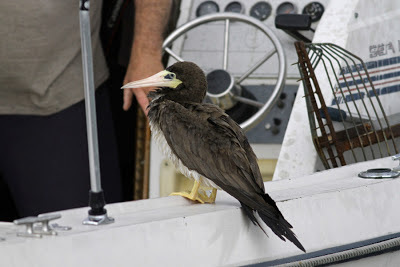 The booby broke away from the gulls, flew towards Larry's boat, and to our amazement actually landed on his boat! I think Larry was even more stunned than we were. The booby seemed to enjoy Larry's company. It was happy to hang out with him for several minutes, not caring whether Larry was laughing, taking photos, or talking to us as we circled him in our boat. Yes, it gets even better. Frank Gallo, Patrick Dugan, and Jake Musser were on shore, stuck looking from the marina parking lot. They were having trouble seeing the boat & bird well as they were blocked by the docks and tall boats, settling for fleeting glimpses. So, naturally, Larry delivered the bird to them. 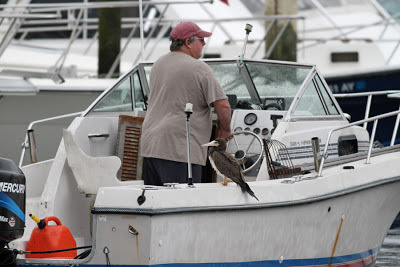 He pulled the boat into the marina, right up to the parking lot area, so the others could see the bird. And there it sat, still keeping Larry company while being admired by a few more *completely stunned* birders. Unbelievable. After a bit, the booby decided it was time to let Larry off his boat, so the bird flew back towards the channel and out of sight. It was not seen again that day. After the storm passed, a new group of birders joined me on the boat in search of the bird. 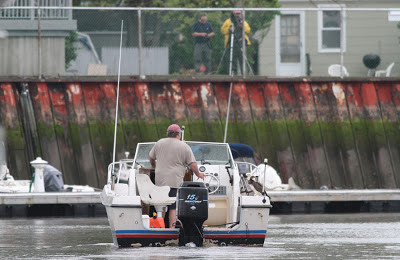 We gave the inner Norwalk Islands a good search but came up empty. 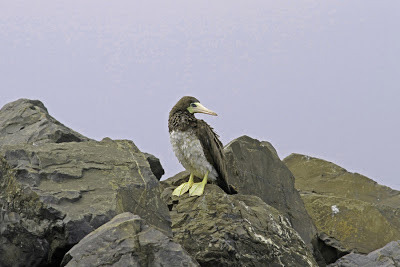 The booby likely did not go very far at that time of day, so it may still be in the area. It is still difficult to comprehend exactly what happened out there today. Simply surreal. This will undoubtedly be cemented as a Top 5 Connecticut birding moment for the rest of my life. This is typical booby behavior; it's how they were named actually. The bird was flying strongly and seen fishing successfully. 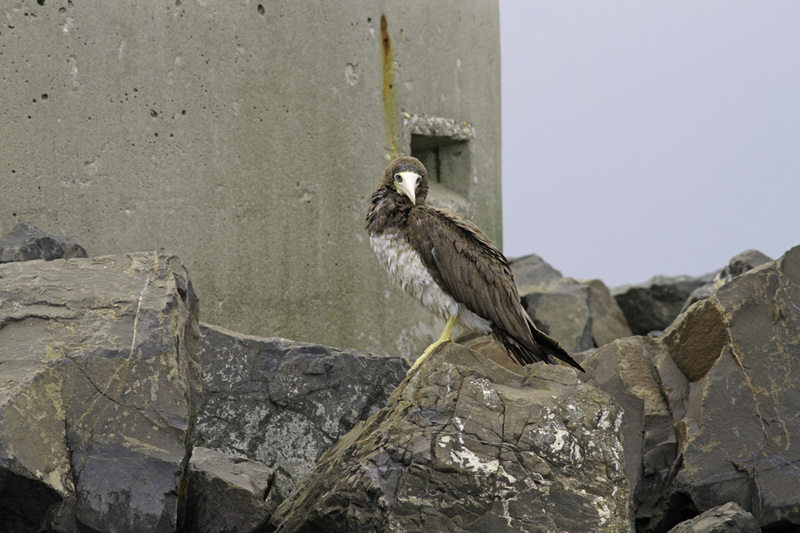 But as Keith Mueller points out, the ratty condition of the bird's feathers could be indicative of poor health. 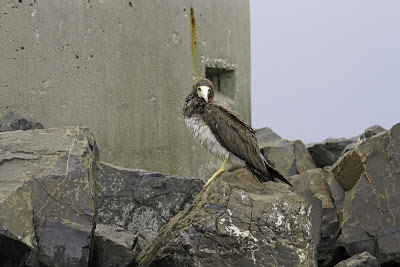 The fact that the bird is in Connecticut is not as shocking as it would have been just a few years ago. 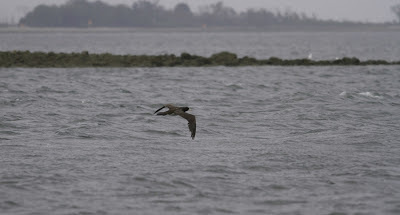 Something is going on with Brown Boobies, several of which have dispersed up the east coast as far north as Canada over the past few years. A couple have even remained in the same area for weeks, seemingly healthy and happy. The first photo of Larry and the Booby has to be the greatest photo ever taken or a rare bird in CT - nice one Nick! I guess Larry really is a "chick" magnet! Short of Larry being in a tuxedo I don't think anything could have made this story more absurdly hilarious and wonderful! Congratulations on a state first (especially to the birders who had it driven to them!!!). If the transcript of that phone conversation ever go public please let me know! "Oh, you don't have a clear view? Let me drive it over!" Just a wild, wild afternoon! Despite spending the day in the Westport/Norwalk area, the bird did not stick in the immediate area. But it could very well be loafing around the shoreline somewhere. Amazing bird and a fascinating way to see it! Its not often you get a Brown Booby chauffeured to your location. Best bird of the Big Day?